What is community to us? Community is our neighborhood, our customers, our friends and other businesses around us. It’s also the schools, the community center and the community garden. Additionally, our community includes, by mere presence, visitors to the area, our friends and family out of the area. Farmers and workers that have some input into our products: growing, packaging, shipping or somehow getting raw materials to our place. This is our community. We think about it, we ponder our community when we make decisions; we are thoughtful about the businesses and people around us. We try to be inclusive when we do events such as the Halloween Street Party and the 4th of July gathering after the parade. What does nourishing community mean? We love the multiple meanings around the phrase nourishing community. It is why we choose to use it. It exemplifies who we are… our desire for our community to be stronger, more together, more understanding and more accepting of the world around us. We nourish our community simply by providing food that is as fresh, conscientious and as unadulterated as possible while providing delicious, affordable and comforting meals. We appeal to all ages, offering a variety of types of foods and beverages, not only so people have a choice when they come in, but also feel comfortable coming in regularly, even daily and have options. We strive to please all types of appetites: omnivores, vegetarians, vegans, and those with particular dietary needs—gluten free, sugar free, etc. Another way we nourish community is by providing space for people to gather. We have held this space for artists to show their work, have hosted many musical events, as well as our famed Halloween street party, 7 years running. We’ve hosted wedding pre-parties, birthday parties as well as catered family reunions and various other gatherings both on and off site. We are supporters of many local organizations, groups, community programs and many of the local schools. For eight years we’ve hosted the Mendocino Middle School Art Exhibition in the spring. We’ve participated in Mendocino High School’s alternative education week offering students a place to learn and work; we are soccer team supporters with Coast Youth Soccer League as well as sponsors for Mendocino United and One Love Futball Club Samuri. We are sponsors of the Community Center of Mendocino, Mendocino Film Festival, Mendocino Theatre Company, KZYX/Z public radio stations, Mendocino Music Festival, the Mendocino Art Center, Caspar Creek Learning Community, Montessori Del Mar Learning Center, the Mendocino Coast Humane Society and the Eileen Hawthorne Fund for Animals and countless other organizations. Many Fort Bragg and Mendocino High School students have worked with us. We have been numerous young adults’ first job as well as being that springboard job for people going into other areas of food service and customer service, as well as providing summer work for those attending college or university. Debit accounts for students are available so that parents know their children have access to food at lunchtime as well as after school. Frankie’s casual and inviting space, in addition to the free wifi, has made us a popular and safe place for students to hang out, socialize and catch up on schoolwork while in town. Regularly, we are thanked by parents, (and occasionally by the kids themselves), for having Frankie’s and the space we provide. And its not just the students who love Frankie’s as a gathering place. 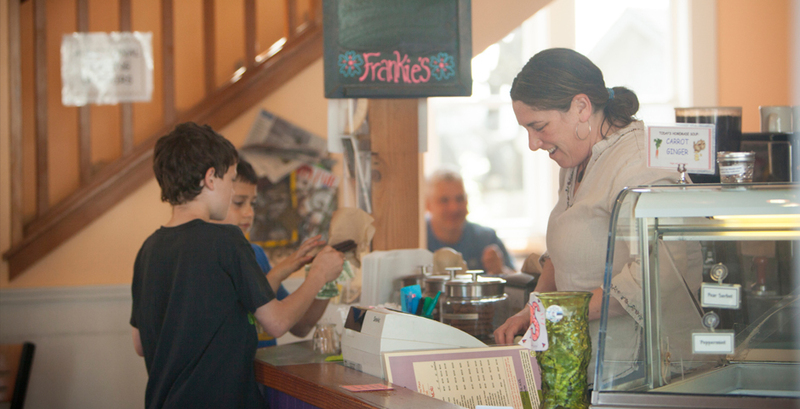 A wide variety of groups use Frankie’s as their meeting space, everything from writing circles to politically active organizations have spent time talking and planning over pizza and ice cream, coffee or tea. While we feel we offer a unique space for our village and community, we would also like to acknowledge the other local businesses that we support and who support us. We help each other out by joint ordering when needed, borrowing and lending products and sharing fridge and freezer space when we’ve either run out of room or have lost power due to storms. Having neighbors to lean on makes all the hard work a little bit easier. When we first thought about buying Frankie’s from the original owner, Mary Muto, it was to take what she started and elevate it to the next level. For almost a decade, we have worked hard to live up to our goals and aspirations and feel proud of what we have been able to accomplish. We thank everyone who has been a part of it.